As with any motion picture release, the scourge of the industry are bootlegs. There are two types of these -- direct copies of video releases, and copies of an in-the-theater showing. Since the film has not been released on video yet, I'll concentrate on the latter form. Someone sneaks a camcorder into the theater and records the film directly off the screen while it's in progress, then uses that to make copies for illicit sale or download. In some cases, those on the "inside" steal a copy from the theater after the last show of the evening, make a quick copy, then return it before the theater opens up the next day. These bootlegs end up on the internet, where they can be downloaded for free; they are also often sold on the street and at flea markets on VHS, DVD and, for the Asian markets, VCD. In some cases, they even end up on eBay, just like the example I'm about to give you. This bootleg copy was one of several up for sale on eBay by a bootlegger in Britain. I assume the source copy of this bootleg was from a camcorder-toting moviegoer in the US or Canada, as, when this bootleg was put on sale, the film was not yet available on legal VHS or DVD anywhere in the world -- a release date hasn't even been announced. In fact, the film was yet to be released in British theaters when this boot went on sale. 1. The spine of the case uses the same spine used for The Rugrats Movie, but changed the color, changed the logo, and even tacked on a couple "Nick.Com" logos. When the legal DVD comes on sale, it'll look completely different. Also, Nick often plugs their website in tiny type near the UPC, not blatantly on the spine. And considering that it's a British release, it should've been "Nick.Co.UK". 2. The back cover -- The film's description is in a typewriter font. It also has a cast list, which included some misspellings and inaccuracies, including a credit for LL Cool J as the Piki doll, whose role was later cut from the film. Also, it mentions that the film has dialogue in English and 2 other languages, plus closed-captioning and subtitles, along with Dolby stereo, but considering that it's a boot, you can bet that it has none of these things, except for a cruddy English dialogue with audience responses (laughter, muttering, coughing) thrown in. And to make it look legal, it includes a UPC code, proof of purchase, and even a copyright notice. DUE TO COPYRIGHT LAW EVERYTHING BEING SOLD IS AS A BACKUP FOR PEOPLE WHO DO NOT HAVE THE FACILITIES TO BACK UP THEIR OWN CDS. AS SUCH ANY ONE BUYING IS AGREEING THAT THEY EITHER OWN THE ORIGINAL OR ARE USING IT AS AN EVALUATION COPY AND WILL DESTROY IT AFTER 24 HOURS. OBVIOUSLY THE ONLY PERSON WHO CAN CARRY OUT THE ABOVE IS YOURSELF, WHICH MEANS THAT I CANNOT BE HELD RESPONSIBLE FOR YOU'RE YOUR ACTIONS ONCE ANY OF THESE ITEMS ARE BOUGHT. But of course, a bootleg is a bootleg, and one of a film still in theaters, and recorded at a theater, is much more serious. His fatal flaw might come in a form of a phone number, which he left on eBay; doing so may invite undesired business -- the police, perhaps. Apparently, eBay took a hint -- as of 6:50PM ET on 7/6, eBay has since pulled the boots from auction, proving that you can fool some of the people some of the time, but you can't fool eBay. Very likely bootleggers in Asia will also issue bootlegs of their own, but some of them would opt to wait until the R1 DVD is released in the US. Though with Asia being a hotbed of bootlegging (Hong Kong in particular), don't say they haven't tried. One Hong Kong Based DVD site is also selling DVD boots of the film. It has a different cover than the British boot, but also uses the final movie poster for the front cover. The HK boot features subs in English, Chinese, Thai and Bahasa, plus scene selection and menus, just like the legit DVDs. As for source -- very likely it's the camcorder, as judged by the 1 star out of 5 quality rating the site has given (at least they're telling the truth about what to expect). 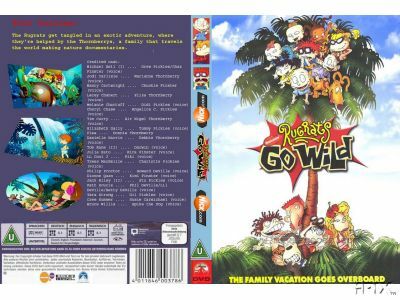 For more information on the Rugrats' film bootlegs that I covered in the past, click here for The Rugrats Movie, and here for Rugrats In Paris.